For the folks over at IBM Design Thinking isn’t just a buzzword: since 2012, the US-based software behemoth has taken Design Thinking above and beyond, building creative practices into the heart of their human-centred design process. At the 30+ IBM Studios worldwide, 1000+ designers are charged with bringing a user-centric perspective to IBM products, digital platforms for clients, and branding and marketing outputs. The ultimate goal? To find innovative solutions to user problems, and to do it on a global enterprise scale. Doug Powell is one of the guys in charge of reaching that goal. 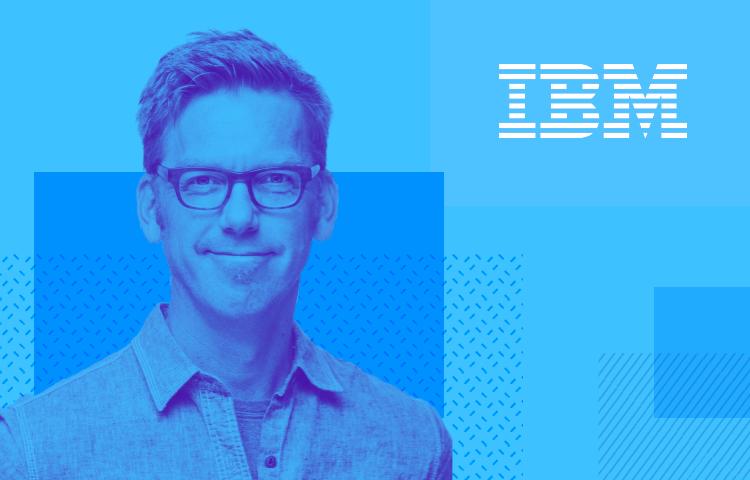 In his role as Distinguished Designer, Doug develops a network of global IBM Studios to establish a go-to-market platform for human-centred design. So far, he’s played a role in building and maintaining the largest studio network in the world – 33 and counting – bringing innovative services and products to market. When Justinmind got the chance to chat to Doug on the phone, we wasted no time in picking his brains about prototyping, applying Design Thinking to enterprise systems, and what the future holds for enterprise software. You’re in IBM’s Design Studio in Texas – introduce us to IBM Design. That’s right, I’m in Austin, Texas, the home-base of our design program and the largest of our global network of IBM studios. We now have 30 studios around the world but this was the first; we have over 300 designers based here in Austin so it’s always busy, and a fun place to be. IBM Design, as a program, is now 4 years old – IBM Design general manager Phil Gilbert stepped into his role just about 4 years ago, the fall of 2012 – and the program really began to take form in the early part of 2013. We hired our first significant cohort of designers in the spring of 2013, and we’ve been on a pretty aggressive recruiting campaign since then. In fact 56 new designers just got started with us in July and are wrapping up their 3 month onboarding boot-camp experience this week. I think that’s one of the narrative threads of the program – how fast we’ve been able to scale things up and build IBM Design out. Can you explain an average day for you and your team at the IBM Studio? In the last year we’ve really noticed a maturation of the program. The teams populated by our designers have really settled into their groove, and the growth of the first couple years has settled into a pretty steady clip. That’s great to see! We’re seeing teams fulfill the initial promise of working in a multidisciplinary way, in an agile way, in an iterative way. A continuous delivery environment is a reality for most of our teams. Can you outline for us how Design Thinking works at IBM, and what are the specific challenges of establishing a design-focused methodology in an enterprise atmosphere? One of the challenges of applying Design Thinking at IBM is that we are a global company with a presence in 170 countries. And virtually every team based here in Austin is working with collaborative partners and project stakeholders in other global locations, in some cases on the other side of the world. That means you have to be really careful about what you do with those 2 hours, because that is a critical period. If you just blow it off and say “oh we’ll figure it out when we get there,” too often those 2 hours just disappear. What we’re seeing is that the constraint of these dispersed teams actually becomes a forcing factor for better planning, better team management , better project management, and ultimately a more agile workflow. That’s just one example of how the challenges of a global organization like IBM become something of an advantage. But what about the complexity of legacy products? Can you turn that into an advantage for designers? Yes! The legacy products of IBM are the backbone of our company. The ‘user’ of yesterday was a deeply technical expert, someone whose entire career was built around running a particular system. But what we’re finding now is that the teams we’re designing for are much more complex than they used to be. They still often involve those deeply technical experts, but now involve less technical users as well; there are even people with no technical training at all working alongside technical users and developers. And so that becomes an interesting challenge for a design team – to create a user experience for a deeply technical system that a non-technical user can engage with. That is a classic design problem, the type of problem that we’re addressing every day here – trying to make tech systems easier to engage with for non- or low-tech users. What specific techniques do you use to focus on users, and how do you build your user findings into IBM’s existing products? Wherever possible we do contextual research – we go to find our users where they are. That’s really a requirement of Design Thinking and user-centered design. You can’t get to a user-centered outcome by passive research. You can’t just send out a survey or look at market trends, and you can’t even just call them up on the phone. You need to go and find that person. It’s so revealing to go and see how they live their workday, and discover the nuances of their daily experience that really inform the user experience. Think of that famous Henry Ford quote, the one about faster horses: if you ask people what they want, they’ll give you a list of technical features that they want to tack on to a product or services; but if you go and watch them, other possibilities reveal themselves. One of the examples that I love to talk about comes out of IBM’s cyber security portfolio. This is a deeply technical space, really techy stuff! The average user is a cyber security expert within a large corporation, charged with monitoring and analyzing the security threats that their systems face over time. By really getting to know these users our security design team discovered a problem: a cyber security expert within financial services company X is completely isolated from the cyber security expert at company Y; in other words, this entire community of security experts who all have a rich body of data and knowledge wasn’t able to share that data and knowledge with each other. Meanwhile, the bad guys out there are all connected to each other and they’re all sharing data! So, what we’ve done is create a space where a community of cyber security experts from different organizations can share their data with each other in a safe way and secure way. So they’re able to learn from each other and get smarter than they’ve ever been before. What role does prototyping play in making IBM Design Thinking a reality? Well you’ve hit the nail right on the head. Prototyping is essential, it’s one of the core principles of our Design Thinking framework. Not just prototyping, but prototyping at as low a fidelity as you can, as early as you can. And also not thinking of prototyping as a separate activity: our teams are prototyping all the time, not in a specific part of the process. It’s integral. If we’re doing user research, we prototype in the lead-up, we share that prototype with the user, we learn from how they interact with it, what they say about it, how they behave, and then we respond to that immediately by creating another prototype. That’s how we work. What makes a great enterprise UX/design team? We require that our teams have a multidisciplinary skill set. We populate our teams with four different design disciplines – visual design, UX design, design research and front-end development. That front-end is where they can be cranking out those prototypes. The Design Researcher is charged with getting to know that user and simplifying those insights so the teams can act on them. The other aspect to creating a good team is considering who team members interact with externally. We call it the 3-in-a-box model, which encompasses Design, Offering Management, and Engineering (Offering Management is what might be called Product Management at other companies). When those three partners are aligned with each other and truly collaborating as a whole team, then the barriers to market really fall away. And we find that Design Thinking is what facilitates those 3 groups – who have different ways of working, different sets of priorities in their DNA – to work together. Design Thinking is a great neutral template and neutral space for a diverse team to come together and address a complex problem in a cohesive way. To do Design Thinking you need more than just designers…. What will enterprise software look like in 10 years? I think we are on the cusp of a design and user experience revolution in enterprise software. If you look at the last decade – we’re now coming up on 10 years since the introduction of the iPhone – it’s been a revolutionary decade in terms of design and user experience in our personal lives. I think we’re just beginning to see that activity move into enterprise technology, and it is more than needed. There’s so much work to be done on enterprise technology to get it to where consumer technology is, if you want to make such sharp definitions between the two. There’s so much opportunity. Some companies with an emphasis on consumer technology are now beginning to see the possibilities of technology in the workplace. IBM is so well positioned for this, because we own that space. We are established leaders in enterprise technology. That’s why when Apple was looking to get into enterprise technology it wasn’t surprising that they called us to forge the really exciting partnership that we have with them. I think that’s an indicator of how much value consumer technology companies see in the enterprise sphere.